You require an accurate, reproducible pyrometer for research, to assure consistent, quality products, or to develop new products, processes, and diagnostics. All types of radiation pyrometers are available, but which one is right for your application? A brightness pyrometer? A ratio pyrometer? A multi-wavelength pyrometer? How will you know? Fortunately we are here to answer these questions and solve your problems. Until now you’ve had little help in answering these questions. Pyrometer specifications refer to ideal targets. Until now, when you’ve needed to make real-world measurements you’ve been on your own. What’s the emissivity (or the relative emissivity)? Does it change with composition, temperature, processing, or time? (Yes, it does.) Does the environment interfere? (Yes, again!) You shouldn’t have to worry about answering these questions; your pyrometer should answer them for you! The SpectroPyrometer does exactly that, and more. If your pyrometer does not, you will unfortunately suffer the consequences. To production this means lower yields and compromised quality; to research it means a missed opportunity. In any situation it simply means the wrong temperature. Now there’s somewhere to turn. We can solve your temperature problems. Our revolutionary expert system multi-wavelength pyrometer, the SpectroPyrometer, will give you the temperature information you need, accurately, and in real-time. The expert-system multi-wavelength pyrometer that we developed, patented, and manufacture needs no prior knowledge of the target or environment. You don’t need to enter any information. You don’t need to know the emissivity, or the relative emissivity; the SpectroPyrometer will tell you what they are! It can make do with a fractional, obstructed view of the target. SpectroPyrometers have a revolutionary and unique feature — the tolerance — that tells you the accuracy of each temperature determination! This means that you instantly know the quality of each measurement. No other pyrometer can make this claim! Our pyrometer also displays the emissivity for every measurement. This will tell you whether you’re looking at metal or slag, possibly even which alloy is being melted. You’ll know if the sight port is getting dirty or if there is a problem with aiming the optics. With our expert-system multi-wavelength pyrometers you can solve your problems once and for all so you can stop worrying about the temperature and do what you do best! 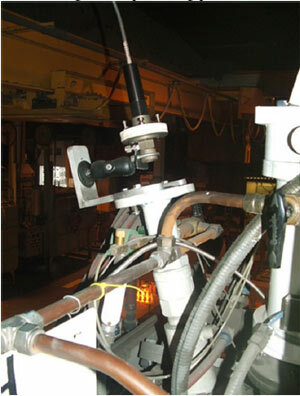 SpectroPyrometers for temperatures from 300-4000°C. Non-volatile storage of raw data and temperature outputs for later analysis. On-site temperature measurement analysis. We will come to your site with all the appropriate equipment to resolve your temperature measurement problems. Emissivity evaluation of your target. We can measure your target here to give you spectral emissivity as a function of temperature. This can alert you to the nature of the problems you will face in non-contact temperature measurement. 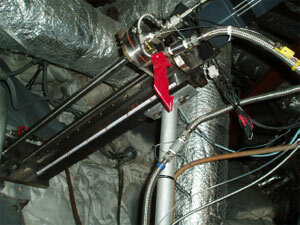 Calibration of pyrometers, NIST-traceable, from 300-3000°C. We conform with ANSI/ASQC Q93-1987, ANSI/ASME NQA-1-1994, and MIL-STD-45662A. In today’s business environment it makes sense to purchase the expertise you need if it is available. Consequently, we’ve done everything from telephone consultations to complete temperature metrology programs in a variety of industries. We will diagnose your problem, prescribe a solution, and help you apply it. We succeed where conventional pyrometry has failed. Call or e-mail us and we’ll tell you how we can help.